For several decades digital 3D models and virtual environments have been used in the domains of archaeology and cultural heritage. Over time, the advantages of these digital visualisations of historical places and landscapes have become widely recognized and appreciated. Much knowhow is now available regarding their usability and effectiveness in meeting specific goals, for instance in education. Here, in an overview of 3D visualisation addressed to professionals in the cultural heritage domain seeking the most effective means for telling their stories to their audiences, we will discuss the stages involved in the development of a large-scale interactive 3D visualization. The focus will be on some practical and theoretical questions which often arise during the process. We pay particular attention to three important topics: user-centred design methods; the challenges of using historical sources and modern techniques to build large-scale virtual environments; and visualisation styles and presentation modes, such as those used, for example, to represent temporal changes or to create ambience. Physical models of historic buildings and archaeological sites are valued elements in cultural heritage exhibitions. These miniature but otherwise lifelike representations draw the attention of visitors and keep them visually engaged by showing many details and, at the same time, offering a comprehensible overview. They provide a picture of past environments, in which visitors, with minimal mental effort, can imagine themselves walking around. Creating a mental image of a building or environment using only maps and elevations, however, requires spatial visualisation ability and experience in interpreting technical drawings, which not all individuals possess. It also requires some knowledge of the structures represented, about materials and colors, for instance, in order to fill in information lacking in the drawings. Computer-based 3D visualisations are increasingly replacing such models; for they present spatial information in a more engaging manner, one that nonprofessionals can quickly recognize and understand. Moreover, they can also visualize changes over time, and they allow one to actually move through a building, or to interact with objects in an environment and through time. With 3D visualisations or virtual environments we can reconstruct, for example, castles of which only ruins remain, cities that have disappeared completely, and landscapes changed by human interventions, and we can represent them in visually attractive, interactive, and user-friendly applications. Objects that were removed from sites can be shown in their original context, revealing the functions and use of both the objects and their immediate environment. New methods for cityscape and landscape modeling, together with advanced data collection techniques, now support the semi-automatic creation of large-scale virtual environments of vast regions. In these environments, detailed models of settlements, of other man-made constructions, and of landscape features can be included. These may support viewers’ awareness of the impact of the natural environment on the development of a settlement, on the daily life of its inhabitants, and on their relations with surrounding landscape and people living there. 3D visualisations can also convey the so-called “affective” qualities of places; these are characteristics that make viewers experience emotions towards the environment, such as excitement, fear, attraction, etc.1 Virtual environments are able to induce a sense of presence in the user, which involves him or her even more fully in the depicted environment. Recent technological developments in computer graphics (manifest in films and games) and in hardware such as smartphones and tablets have raised expectations of users about the experiential quality and functionality of 3D applications, and about the ubiquitous availability of these applications on different platforms. Aesthetically pleasing and engaging experiences are becoming increasingly important in efforts to involve the general public, who are now used to the high quality graphics and audio offered by the entertainment industry in films and computer games. 3D visualisations are flexible and effective media for conveying complex spatial or geographically-based information to a varied audience. For research purposes, 3D models have proven to be of particular value in reconstructing buildings or sites that have a long and complex history, and in comparing alternative solutions. In practice, projects for developing 3D models of historical sites often emerge from a desire on the part of domain experts and IT professionals to present large quantities of spatial data to a broad (unspecified) audience, and for a range of objectives that are not well specified. As a result, the effort is directed towards accuracy in modeling rather than towards achieving a specific user experience. Developing 3D visualisations as an “experience tool” for laypersons, however, requires a user-oriented approach, and different modeling techniques. The prospect of recreating a historic environment with virtual reality techniques is so enticing that heritage professionals may embark on projects with great enthusiasm – with ambitious but not precisely defined goals. Just as in other IT projects, however, it is crucial to adhere to well established methodologies for software development that support design decisions, and ensure that users will be satisfied with the product. The first step consists of analyzing the requirements for the intended product. User-centred design (UCD) methodologies offer a range of techniques to establish the user requirements of an application before actual design and development take place. The first questions in every visualisation or virtual reality project should be: for whom are we developing this visualization? What do we want them to experience when they interact with the virtual environment; and what should they learn, and still remember a week later? Should the user be surprised, engaged, or impressed? Is the goal to enhance understanding of, for example, the impact of settlement patterns on the modern landscape? Or, perhaps, to create the sensation of being present in another era? Understanding of and consensus on these issues between all the parties involved in the visualisation project can reduce the risk of miscommunication and, ultimately, even of failure. Personas and scenarios are examples of techniques that are useful in this context. As Pruitt and Gruding explain, teams which do not utilize Personas routinely make decisions about features and implementation without recognizing or communicating their underlying assumptions about who will use the product and how it will be used.2Personas help to focus attention on a selected audience and prevent developing an application for a vague concept – for ‘everyone’. Personas are descriptions of persons who are representative of a typical (desired) user group. The description, often complemented with visual materials, includes, for instance, gender, age, education, interests, goals, activities, computer skills, and attitudes towards technology. Members of a design team write the Personas, using the results of, say, market surveys, interviews, and the study of visitors’ behavior on location, such as at an archaeological site or an exhibition. Once created and made believable and appealing with photos, Personas facilitate communication in the development process. Once Personas are established, scenarios can be created which represent the desired activities of the potential users of the application. A scenario is a story, a description of a typical activity of a specific user of the application, including intentional but also unintentional actions, as well as the context of use, such as location, time, and the presence of other people. Scenarios help us to imagine how the application will be used, and how contextual factors may influence this use. They focus attention on the intended user experience rather than on the display of technical novelties. From an analysis of the Personas and scenarios, one can derive the requirements for the appropriate 3D visualisation; these describe the functionalities of the application and visual features of the 3D models, etc. Other stakeholders add requirements to the list, which may concern similar issues, but also the availability of the application on different platforms, its usability, and so on. Proper analysis of all these factors results in the right list of requirements for the designers and developers of the 3D environment. The design and development of an application is a cyclical process. After the requirements analysis, a team will start on design, development, and evaluation. In every phase, however, new questions will arise, ideas will change, and, thus, earlier results may have to be revisited. Important issues in the design and development of cultural heritage visualisations are the scale and level of detail used in showing the viewer the environment and its elements, which may range from detailed objects to vast, even global, landscapes. Today’s technology offers different techniques appropriate to the required scale and level of detail: feature-based modelling and procedural modelling. Feature-based modelling refers to the modelling of individual objects (features), usually small in scale and with a high level of detail. Procedural modelling concerns the large-scale augmentation of a digital terrain or landscape model containing individual virtual objects, such as buildings and trees, based on rules and conditions (procedures). The choice of type is determined by the requirements of scale and level of detail suited to the intended use. Individual objects can be captured with a high level of detail using close-range photography or laser scanning. From their output, detailed and textured 3D models can be produced semi-automatically. For large objects (e.g. buildings), the challenge is to completely capture the object from all sides to create a full 3D model. If buildings and landscape elements are no longer visible in the landscape and no similar objects remain elsewhere in the world, they must be modelled using historical sources such as historical floor plans and building maps. Using 3D modelling software, the object is then created through a largely manual process. Data-capturing methods used for objects are also suitable for large sites or vast landscapes, but require different equipment. Photography and scanning can still be used, but in that case, from the air or mobile platforms. They produce a lower level of detail but a larger amount of data as a result of the larger area covered. The data are processed by a digital terrain model (DTM) representing the size and shape of the actual landscape terrain. If a landscape has changed significantly and no traces of older periods are visible in the field, the digital terrain model is created from historical sources like maps, paintings, and drawings. However, these sources generally provide limited or inconsistent information, leaving us with many uncertainties concerning the exact historical situation. Cartographers, for example, created their maps employing deliberate abstractions from the real world, leading to geometric, chronometric, and topographic inaccuracies.5 Fortunately, tools are available to detect such inaccuracies in historical maps.6 In a 3D visualisation one needs to communicate the remaining uncertainties in some way or another using uncertainty visualisation techniques such as transparency or non-photorealistic rendering.7 Next, 3D procedural modelling software is used to add landscape features, such as buildings and trees, to the digital terrain model, based on rules and constraints (procedures). An example of procedural modelling is described by Dylla et al .8 for the Rome Reborn project, which is presented later in this chapter. The clash between scale and level of detail, on the one hand, and the project’s budget, on the other, necessitates design choices about image quality and representation style, choices which influence the perceived credibility of the reconstructed area, and the experience of the viewer. When choosing a strategy, it is again the objectives of the project that must be considered, since accuracy and appeal of 3D environments may be conflicting desiderata. There is, for example, evidence that 3D visualisations are perceived as more trustworthy and more convincing than other, traditional representations,9 so that an attractive, high quality visualisation might easily be considered to be a truthful representation of an historic environment. Style also influences the user experience of the environment. The emotional response to a virtual environment is influenced by sounds, the presence of virtual humans, animals, vegetation, atmospheric circumstances, and dynamic elements and details such as dirt and litter. Although game engines allow one to represent these elements in detail, with a photorealistic effect, using them is laborious and demands a great deal of skill, as well as thorough research; and if the relevant research is not available, their use becomes heavily dependent on assumptions and interpretations. Again, the objectives of the virtual environment are paramount in deciding on the style of the end product. Is the goal to engage young people with a compelling visual experience, or to provide an objective overview of the layout of an archaeological site? Another question that has to be considered in this phase is how users can be guided through the virtual environment in a way that leads them to discover and understand the message the designers want to convey. Their experience needs to make sense and to meet the objectives as originally defined. One of the major advantages of interactive 3D environments is the freedom of navigating them. The ability to choose routes, viewpoints, and pace creates a unique and individual experience. However, when viewers are located in an environment without clear directions they may feel lost, overlook important features, and lose interest. Fencott et al.10 have developed the Perceptual Opportunities model (PO-model) to encourage users to follow a predesigned route through an environment, using attractors and perceptual rewards. From the entry point in the virtual environment, the viewer’s attention is drawn by, for example, an animated object or a mysterious feature. When the viewer reaches this location, a visual or auditory effect is triggered, after which another event or feature draws his or her attention. The effect may contain information on the object or environment, so the “reward” consists of discovery and learning about the environment. This technique helps designers to focus on the intended user experience, and to consider the different roles and meanings of features in the environment. When the conceptual design is completed and approved by stakeholders, and the techniques that might be used have been explored, then the implementation stage begins. We will now discuss four projects to illustrate different techniques and objectives. 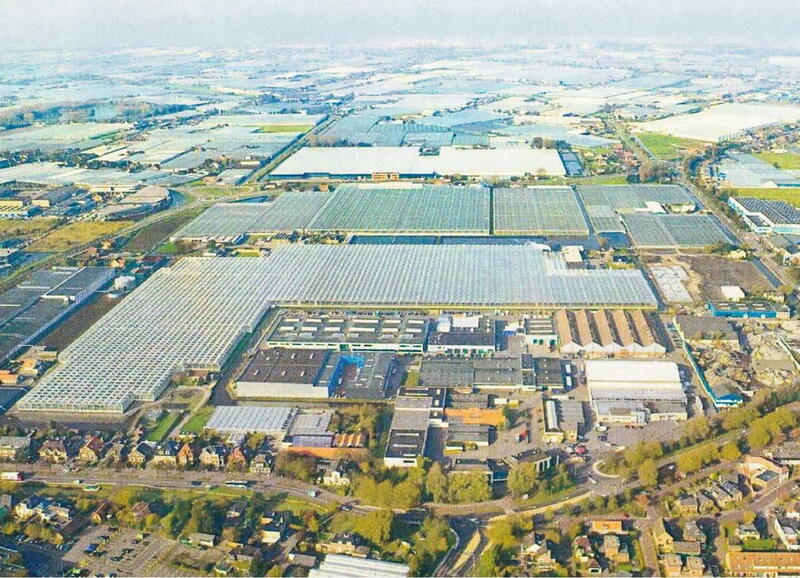 The project ‘Things have changed’ aims to facilitate visual assessment of landscape changes between 1900 and 2006 in a region in the southern part of the Netherlands.11 This was the landscape that Vincent van Gogh drew and wandered through. The visualisation offers the audience the chance to explore its transformation from a landscape with small-scale urbanisation and natural habitats to a modern landscape characterized by extensive, large-scale man-made interventions. Navigating through the environment, viewers recognize the effects of landscape features on sightlines, and how the landscape influences the experience of a visitor to the area. This supports, for example, studies on Vincent van Gogh’s writings and drawings in that specific area and period. The 3D visualisation is created using topographic maps made in 1900 and 2006. We verified the visualisation of the historical landscape with the aid of paintings from that period, and of the current landscape using present-day views. Both the historical and current landscapes are portrayed in the same way. Screen capture. Things Have Changed user-interface showing the 1900 landscape in the Southern part of the Netherlands at the top left, the 2006 landscape on the top right, and the route and current location at the bottom picture (Henk Kramer, 2006). Only the most distinctive landscape elements (e.g. roads and land-coverings) and 3D objects (e.g. trees and buildings) are modelled. In this manner, we produced two virtual landscapes in a similar visual style. Finally, animations are rendered 12 along a flight path through the virtual landscapes. The animations of the historical and current landscape are juxtaposed and, together with a 2D route map for navigation purposes, presented to the user (see Screen Capture Tings have changed). The evaluation of the project showed that viewers appreciated this technique as an instrument for visually comparing landscapes. However, they indicated that it was difficult to simultaneously perceive and understand the changes presented at different locations on their screen. Other evaluations included remarks on the modern look and feel of the 3D environment, which did not convey an historical ambience. One reviewer suggested including period artifacts such as an old wagon and a small cottage. These comments show that viewers expect, and look for, cues that help them to vividly imagine the historic environment. 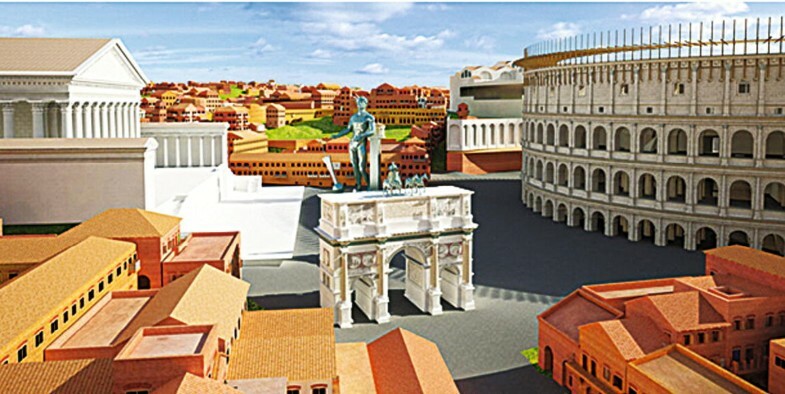 For the Rome Reborn project, a virtual reconstruction was created of the entire city of ancient Rome at the height of its urban development, in 320 AD. The primary objective was to spatialise and present information and theories on how the city looked at that moment in time; and the secondary aim was to make available the sources of archaeological information and the speculative reasoning supporting the digital reconstructions.13 Projects such as these are often initiated as showcases and are intended to explore the application of new technology in new domains. Goals and audiences are only broadly defined, and the knowledge acquired during the development process is seen as one of the main motives for these projects. 3D environments like these offer a wealth of visual information but leave it up to the user to interpret and give meaning to what he or she perceives. An initial version of the digital model was created by laser scanning the existing scale model of ancient Rome known as Plastico di Roma antica.14 Only well documented buildings and structures were modeled in detail using specialized software; others were kept schematic. In a second version, rules were defined in consultation with archaeological experts and applied to refine the representation of the schematic models. Using procedural modeling, an entire virtual city of highly detailed 3D building models was generated.15 The digital model is completed with human figures, atmospheric conditions, and certain details such as vegetation and appropriate small objects, such as statues. Screen capture. Rome Reborn: A Digital Model of Ancient Rome 1 (Rome Reborn, 2007). Screen capture. Rome Reborn: A Digital Model of Ancient Rome 2.0 (Rome Reborn, 2012). The Rome Reborn model is well suited for studying architecture and town planning in the Roman era, but it does not convey an impression of daily life in the city, nor of the life of its citizens. Several recent cultural heritage projects involving virtual reconstructions include crowd simulation to convey the feel of ancient life in real time, based on evidence such as ancient frescoes. One example is a 3D model of Pompeii, which is populated by several types of Roman citizens, including male and female nobles, plebeians, and patricians. They move and behave in ways appropriate to their position in life, and are, for instance, restricted to certain areas of the city, in accord with their social status. The numbers of these virtual humans and their movement result in a varied and, according to the authors, realistic simulation.19 Other projects add music or flora and fauna to virtual cities in an attempt to further enhance the user experience. Screen capture. A crowd of Virtual Romans simulated in a reconstructed part of Pompeii (Jonathan Maïm et al., 2007). Honselaarsdijck Palace 21 was a fortified building acquired, re-built and extended by the Dutch governor Frederick Henry in the early seventeenth century. In 1815, King William I decided to demolish it because it had fallen into ruin after the French Revolution. All that remains is a small outbuilding, The Nederhof; its location is now the site of the De Honsel industrial park (see “Screen capture Honselaarsdijck Palace and De Honsel industrial park). Although there exists a large number of historical maps, prints, and paintings of the palace buildings and its surrounding landscape, these static images can offer only a limited degree of interactivity and perspective. 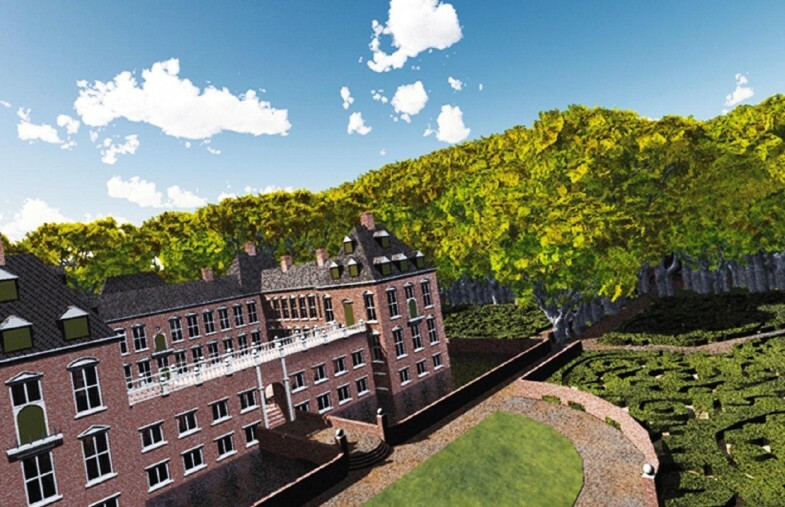 To revive and relive the grandeur of the historic estate and the vastness of the surrounding landscape, we created a virtual reconstruction of Honselaarsdijck Palace for a museum exhibition.22 The reconstruction is capable of giving the modern observer a historical sensation, in the sense that the Dutch cultural historian Johan Huizinga 23 meant by this term: the impression of stepping back into a specific time for a short moment. 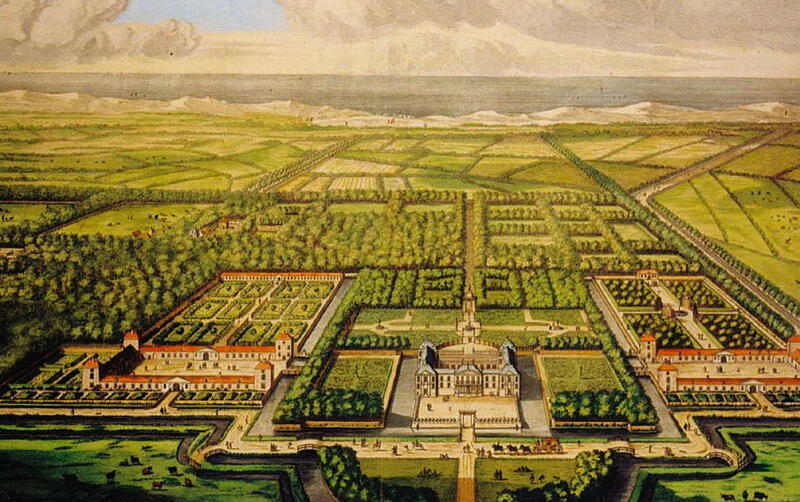 Thus, even if only briefly, a visitor imagines him or herself back in the 17th century, experiencing the glory of the palace and its setting amidst the royal gardens and the historical landscape. Historical maps and paintings, as we have seen, can be upgraded 24 to a 3D virtual environment and made available via an interactive computer interface. In this process, visitors, enjoying a bird’s eye perspective, can “fly” to the different locations on the estate which appear in a historical source. A demonstration is available at http://honselaarsdijck.geo-multimedia.nl. Screen capture. Honselaarsdijck Palace, The Hague, around 1683 (above) and the De Honsel industrial park in 2009 (below) (Arnoud de Boer, 2009). 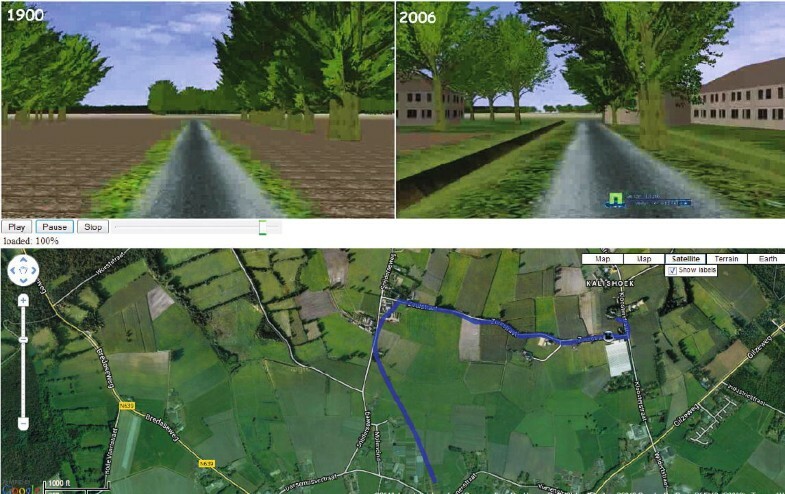 Three key factors contributed to the success of the virtual historic landscape at ‘Virtual Honselaarsdijck’: the ability of users to understand the relationship between the historical sources and the virtual environment, the scale of the reconstruction and the landscape elements themselves, and the quality and completeness of the virtual landscape. In the previous sections, we underscored the importance of designing with the user experience in mind. Too often 3D visualisations are created with a focus on available data and techniques. In order to determine what the goal of the visualisation is and define the desired user experience, one can now take advantage of methods such as Personas and scenarios. During the development stage, representatives of the intended user groups should be consulted regularly to make sure the visualisation meets their requirements and expectations. This will help developers to keep the user in mind and not get distracted by the technical challenges to be solved. In this chapter, we have focused on 3D visualisations displayed on a desktop monitor. Of course, there are other possibilities for presenting 3D visualisations, for instance on interactive and location-aware platforms such as smartphones.25 Augmented or mixed reality techniques allow users to view reconstructions at the actual location, as an overlay or a superimposed image. Because of the rapid developments in software and hardware, it is now even possible to walk through an excavated site such as Pompeii and watch animated characters, virtual humans, as it were, acting out a story in real time in the mixed reality world.26 These new techniques will undoubtedly lead to a completely new stream of virtual heritage applications. One concern we want to express here is whether the currently existing virtual reconstructions will continue to be available in the future. Archaeologists and historical experts make beautiful and detailed 3D virtual models after long and extensive research of a particular place or landscape. Yet, due to the lack of a standard method for the realisation, storage, and exchange of these models, there is a risk that in the course of time they may no longer be compatible, and thus not be able to be integrated into new virtual reconstructions. 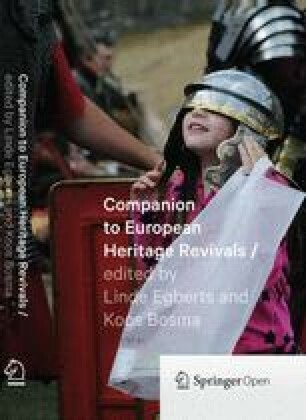 Fortunately, there are initiatives 27 to design and create a central infrastructure for sharing and storing such models, and this may eventually lead to virtual reconstructions on a pan-European scale. Screen capture. 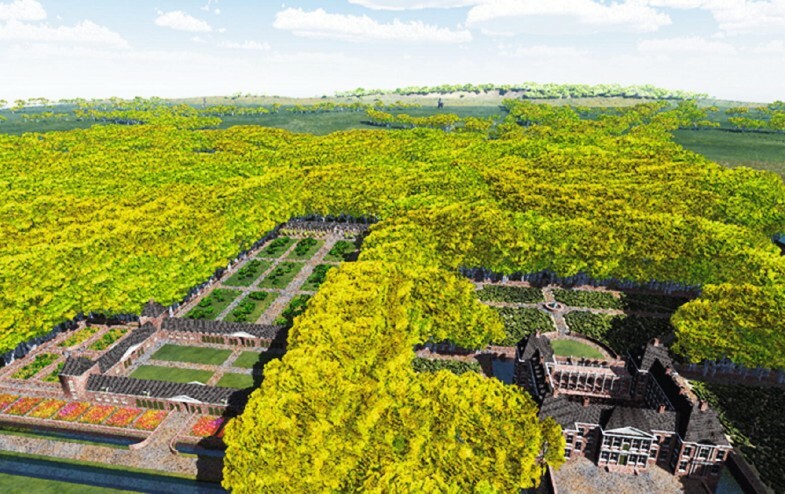 Virtual reconstruction of Honselaarsdijck Palace and its gardening landscape (Arnoud de Boer, 2009).